Hopping in to Bet Victor, Hot Cross Bunnies is one of the most entertaining three reel slot machines we’ve ever encountered; generally these classic, Vegas-style slots lack the bonus features more associated with five reel games but this online slot packs loads of extras into a small package. The graphics and sounds in Hot Cross Bunnies almost make you think you are on the floor of a Las Vegas casino and that impression is reinforced when the bonus game starts, but more of that later. This game is set on a tropical beach, not a natural environment for rabbits but then again they are hot and cross; the symbols are basic – oranges, cherries, melons, cherries and bells – and it’s the pink bunnies that will trigger the bonus feature. Fruit machine aficionados will be familiar with the nudge feature available in Hot Cross Bunnies; it’s randomly triggered and after each spin there’s a chance that you will receive between one and three nudges. Nudges enable you to bump the reels down to try and make a winning line; you can choose to do it manually or click the Autonudge button. If you do it yourself and mess it up, the Autonudge will take over anyway and make sure you get the best win. Following a nudge attempt where there is no possible win, Hot Cross Bunnies will sometimes award you a Super Spin which will reward you with a guaranteed win. This is the good bit and you’ll need to land three of the pink bunnies anywhere on the reels to trigger the feature. The camera will now draw back, revealing the entire machine plus a photo-realistic view of the rest of the casino. The reels will now spin a random number of times and each symbol which lands will fill up one of the fruity meters at the top of the screen. When a meter is full you’ll receive that reward and the meter resets to empty. Lower value fruit meters are filled up first meaning it can be difficult to complete the bells meter but it’s a lucrative feature nonetheless. 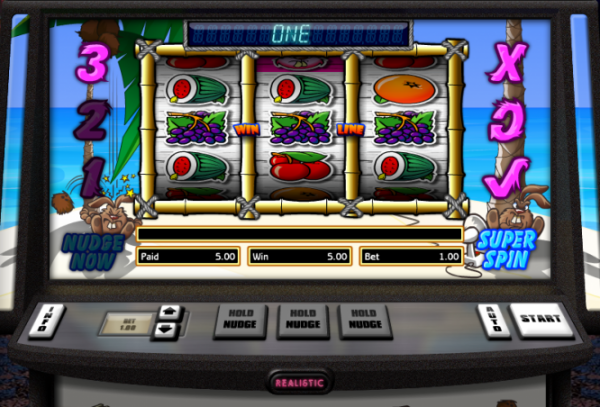 Slots purists may like to nudge manually but to save yourself some time, click that ‘Auto’ button underneath the reels. Paylines are fixed so just sit back and enjoy the game. This is a great slot which brings some extra features to the three reel genre while retaining the simplicity of the gameplay. The sounds and graphics mean this is a very realistic experience.